I used to think Field of Dreams was a deep movie. Then I grew up and realized there’s more to life than baseball and the 1960s. Today I’m going to explain why 1989’s Field of Dreams gets worse on multiple viewings. So let’s go the distance and ease some pain as we explore what went wrong over the years with this classic drama. To be fair, I will first point out the things this film does really well. I like how the movie shows one man acting purely on faith. It’s rare to see a movie in which a character is called upon to do so many things with little or no explanation as to why he should do those things. I particularly like the fact that he has to wait many months before “Shoeless” Joe Jackson finally shows up on his baseball field and starts to unravel the mystery a little. The film tests the main character’s (Ray Kinsella) resolve by making him be patient. I respect that. I also like the performance of James Earl Jones as Terence Mann and Burt Lancaster as Dr. Graham. Jones finds the perfect balance of old-man despondency and childlike eagerness as his character progresses through the story. He elevates the second half of the film right when it’s in danger of faltering. Lancaster does a wonderful job bringing old stories to life and drawing us into his character in a single scene. He is probably my favorite character, which makes some of the things I’ll say about him a little later all the more ironic. I love the climax when Ray finally gets to play catch with his dad. The music keeps inching up the drama and anticipation until finally the ball is tossed between them and we get a beautiful release of emotion. It’s a magical moment that makes up for some of the lameness that has to be endured to get to it. Why is “Shoeless” Joe Jackson in any way interested in Ray being reconciled with his father? All Jackson seems to be concerned with through most of the film is being able to play baseball again. The film doesn’t suggest that he knew Ray’s father or that he is working in support of a divine plan. In fact, the movie never even mentions God. I don’t see how his story coincides with Ray’s, except for the fact that they both involve baseball. The film seems to think that this flimsy excuse is good enough to shoehorn them together. Jackson’s actions come across as mostly self-serving; he throws Ray a bone so that Ray will do his bidding. This is a major problem, and it undermines a lot of the film’s potency. It would have been much more meaningful if Ray was acting on behalf of a higher power, rather than serving as an errand runner for a disgraced baseball player. James Earl Jones’ speech about baseball being the one constant throughout American history is completely hollow to me now, especially after reading the book, Moneyball. That book shows that batting and fielding statistics were manipulated over the years, leading to serious flaws in the sport. It’s only in recent years that those weaknesses have begun to be addressed through computer modeling and focusing on lesser-known statistics. Baseball isn’t some mystical, unchanging yardstick to measure the heart and soul of America by. It’s just a game. 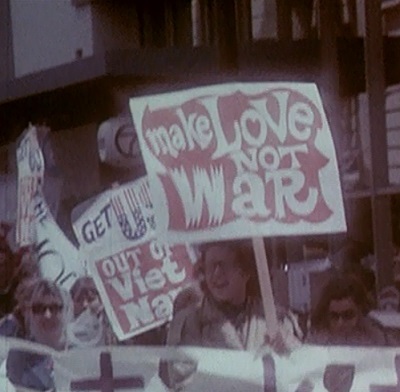 The 1960s were not some sort of utopia. Yes, a lot of good came in the form of the Civil Rights Act of 1964, but desegregation in schools and the military had already been taking place under President Eisenhower and the Supreme Court in the 1950s over the objections of many in Congress. A lot of bad things came from the 1960s, such as an increase in the acceptance of illegitimacy, drugs, draft dodging, and other selfish and negative behavior masquerading as freedom and love. Field of Dreams whitewashes this complex hodgepodge of history and dogmatically states that the ‘60s were great and anyone who disagrees is a prude. That is far too simplistic to be real. This watered-down approach to history rears its ugly head during a meeting between parents and school faculty members. Many parents voice their concerns about a book being pornographic and inappropriate for their children, but their concerns are brushed aside by the faculty saying it won awards and it was written by an acclaimed author. Winning awards doesn’t mean something is healthy for all audiences, though. They never delve into what the book is about or what is in it that caused so much concern. But the film makes an outrageous argument that taking a book off the school curriculum is tantamount to book burning or spitting on the Constitution. No one is saying the book should be burned; they’re simply pointing out it may not be age appropriate for their children. Also, a “conservative” caricature uses an onslaught of personal mockery to try to intimidate Ray’s wife at the meeting, rather than saying anything substantive in her arguments. In my experience, personal insults are usually a tool of progressives, not conservatives. It’s easy for Ray’s wife to tear down this caricature and herd the sheep in the audience to her side because her opponent is not offering anything of value. Watching this scene again after all these years, I realized it is not a triumph of the Constitution over Nazism, but it is simply a straw-man argument taken to an absurd degree. How does the baseball field’s magic work? 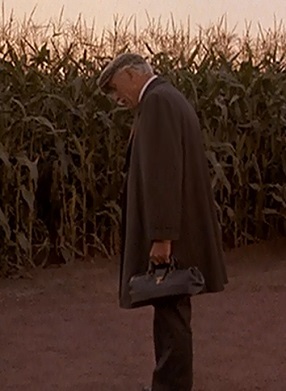 So ghost players can’t leave it without changing form, as we learn when “Moonlight” Graham steps off the field and becomes his old self from 1972. But the film is set in 1988, so shouldn’t Graham have vanished because he’s dead in our world? Why was he able to hitch a ride to the baseball field without becoming an old man on the way? He wasn’t on the baseball field, but he still maintained his youthful appearance the whole way to Iowa. Where did he even come from? 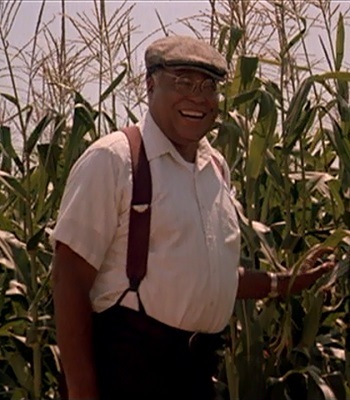 All the other ball players come from the cornfield. Maybe the fact that he was never a real major league player meant he couldn’t come from the same place as the others. None of this makes much sense to me. And that’s my real problem with this movie. The more I think about it, the less I like it. It seemed so magical to me as a kid. But now I see it as a message movie that doesn’t understand what message it’s trying to get across. For example, we’re told that “Moonlight” Graham played one half inning of one game and he never got to prove himself as a baseball player. So he quit and went to school to become a doctor. Over the next 50 years he saved countless lives and served others diligently in big and small ways. And yet, the movie postulates that his dream of being a ball player was more important than all of that. I get really mixed messages because on the one hand it’s sad that this man never got to fulfill one goal. But on the other hand, he grew up and moved on to better things because one part of his life didn’t pan out. It’s not a tragedy that he didn’t play baseball professionally. Seeing him finally get to step up to the plate and hit a sacrifice fly is satisfying, but it’s ultimately irrelevant. He lived a good life and he died happy. All this fantasy does is fulfill a fleeting desire that ultimately means nothing in the grand scheme of things. Yes, he saves the life of Ray’s daughter when she falls and nearly chokes to death on a hot dog piece, but couldn’t Ray just as easily have carried her a few feet to the baseball diamond so Graham wouldn’t have to be stuck forever in the body of an old man? Field of Dreams isn’t a bad movie. But it’s certainly not the masterpiece that everyone seems to give it credit for being. 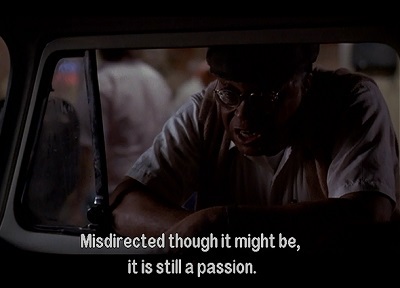 James Earl Jones’ character sums it up perfectly when he says, “I wish I had your passion, Ray. Misdirected though it might be, it is still a passion.” Likewise, I wish I still liked this move because it has a place in my heart from when I saw it as a child. But it’s so misdirected and contradictory, its good intentions can’t make up for all of its flaws. 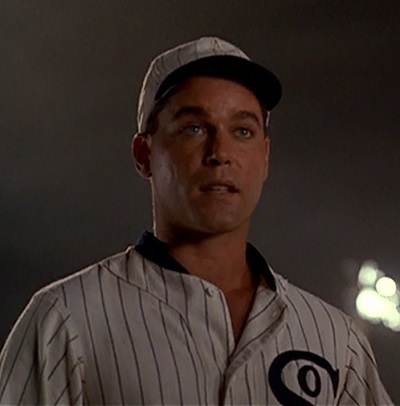 This entry was posted in Movies That Get Worse and tagged baseball, drama, field of dreams, films, funny, history, humor, kevin costner, major league baseball, movie review, movies, movies based on books, politics. Bookmark the permalink. Funny and very perceptive. Well analyzed and said. The magic remains regardless of how much you analyse and dissect its lack of logic. That is what makes it so special. There are not too many films that would survive serious scrutiny when it comes to logic, plausibility and consistency. It reminds me of the old saying- People will forget what you told them, forget what you did for them, but they will never forget how you made them feel. It’s true of people and movies. This film touches my heart every time I watch it and lifts my spirits when I’m down. The father -son element is so rare and beautiful in this age of denigrating men, so it becomes more special to me as the years pass.. There is no questioning the logic off your criticisms, they simply don’t matter to me. I’m sure we could do the same to It’s a Wonderful Life. Thank you for your comment. I wish I could still see Field of Dreams through the same eyes you can. I think Braveheart, Indiana Jones and the Last Crusade, How to Train Your Dragon, and even Superman (1978) have more meaningful father-son relationships than the one in Field of Dreams. I do love the final scene in this film, and the whole film is absolutely filled with interesting ideas. They just fail to coalesce into something that really works once I dig down under the surface of the film at all. I’m glad you can still enjoy this film. It’s certainly not a bad one, I freely admit. Thank you so much for being so kind in your comment. I really appreciate that. I’m with you on this one, Robert. Of course, being me, I never cared for the film even the FIRST time I saw it. And the scene you mentioned above involving the ridiculous caricature “conservative” and Ray’s wife offended me by not allowing a rationale argument to be made. Just once, I’d like to see a movie where the heroes are Conservatives: God-fearing, gainfully employed, non-sarcastic child-raising parents who proudly voted for Reagan and belong to the NRA. C’mon, Hollywood: just one movie. I’ll go to the theater and watch it, I promise. Seriously! Field of Dreams seems more like liberal remorse to me than anything now that I see it as an adult. A young man is so embarrassed over his hard-working father, who happens to be too old to be interesting to him, that he leaves and gets high at college before winding up owning a farm and not doing anything meaningful with his life. For heaven’s sake, Indiana Jones and the Last Crusade had a much deeper relationship between a father and son, and they only had a few moments to chat in between battling hordes of Nazis! I would love to see a movie like the one you described, too. Hollywood just doesn’t see the inherent drama in raising a family honestly and faithfully. That’s where the most important stories of life happen. You’re right. 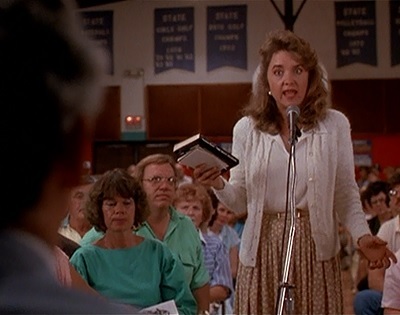 The ridiculous school board meeting is not necessary and nearly ruins the whole movie for me.